A group of drag-racing kids, The Zeniths, are struggling to be a legitimate club with charters and everything. Standing in their way are a rival gang, adults who just aren’t hip to the scene, and a lack of a place to meet. Lois (Jody Fair), one of the leaders, has a lead foot and no problem drag racing against other kids. Tom Hendry (Russ Bender) is a local reporter assigned to writing about the teenage phenomenon of drag racing. The gang receives an offer from Lois’ aunt Anastasia Abernathy (Dorothy Neumann), they can use her old mansion at Dragstrip Hollow if they shoo out all the ghosts that haunt the place. Naturally, The Zeniths decide the best way to do this is with a swinging party. 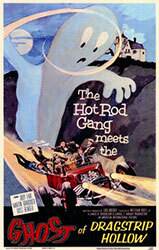 The Ghost of Dragstrip Hollow is a precursor to the beach movies of the 1960s, in that it features weightless comedy performed by teen actors, and plenty of musical interludes. For a movie that barely clocks in at over an hour, it takes a good forty minutes to get to the haunted house. Once there, we get treated to some floating candles, and a few reused costumes from The Astounding She-Creature (1957) and Invasion of the Saucer Men (1957). The whole movie is a goof, thick with 50s slang, and plenty of surf-rock numbers. The times when the movie attempts to be ‘cool’ feel corny and forced now, but there is a freewheeling vibe to whole thing that makes it an effortless watch.